The big reddish-colored tree in the right side of this frame is a California Coast Redwood (Sequoia sempervirens). The oldest of these Redwood trees are much older than you and I. In fact, they are older than most of our recorded human history. 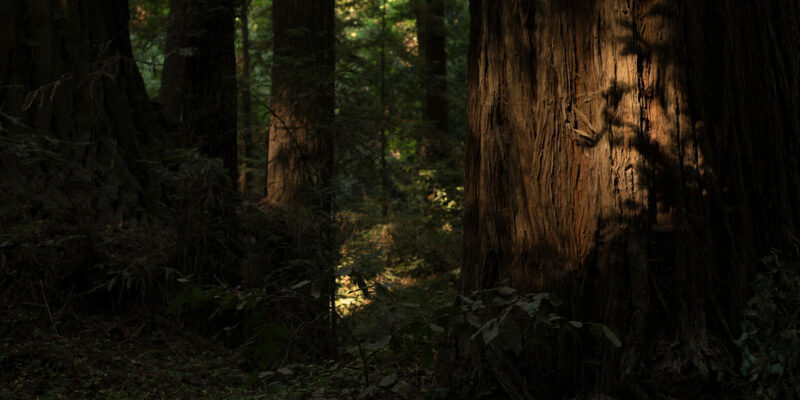 The oldest of these Redwood trees were already great, tall, and strong when the first adobes, missions, and grand cities were being built around them; still living today are Redwoods which were born many years before Jesus Christ, before Muhammad, before Buddha. Yet before any of this, each of these trees was a dispersed collection of atoms, of energy and matter making up various other elements of this universe. 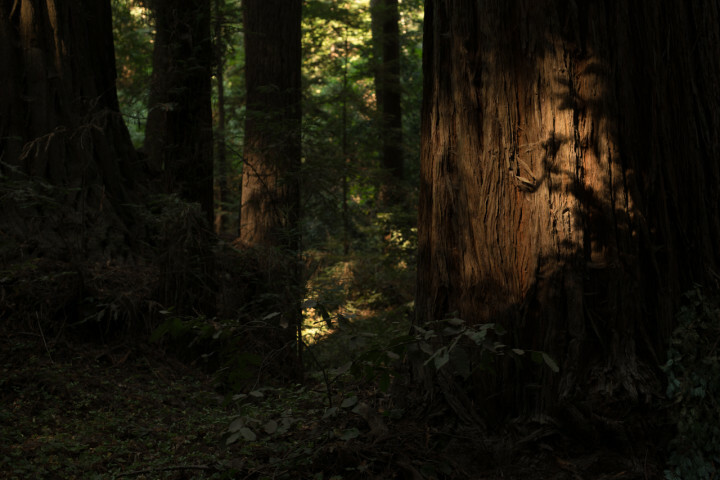 In fact, it is safe to say that each one of us, is also part of the Redwood forest, as we are — by the history of the particles which make up each one of us — a part of the history of this very universe. This kind of thought, while it may come closer to telling the truth about what we are than anything we can calculate in our minds, is by virtue of such distilled truth, mind boggling for us to think of. Our most advanced quantitative and qualitative measurements offer only the smallest pin-prick of a glimpse into what we are, and to why both preservation of — and human connection to — our natural environment is so critical to the experience of living life itself. The most telling glimpse one can get of this concept, is not what we can calculate, but what can be perceived when one forgoes calculations, and comes to know a direct and intimate communion with this nature, realizing (1) that they are in fact connected with, and weaved into the fabric of this earth, and (2) that this interweaving of human and earth gives both earth and human — and all things around and within — a quality which transcends calculation and worth by any human-derived standard of measurement or quality. If you and I are the redwood tree, then respecting this tree and the rest of the natural world is not a question of saving nature. It is a question of saving ourselves.